Wall Mount, equiped with a long reach, drift free positioning arm. It could be installed for use in pass through applications, enabling more operatory stations. THE MOST ADVANCED OPTION IN VETERINARY RADIOLOGY. Corix® 70 VET is equiped with an advanced Beam Centering Device / Collimator, designed to precisely align the x-ray beam over the image receptors / radiographic cassettes, with a format of 1:1.2 - 1:1.25, covering the full range of 8" x 10" to 14" x 17". 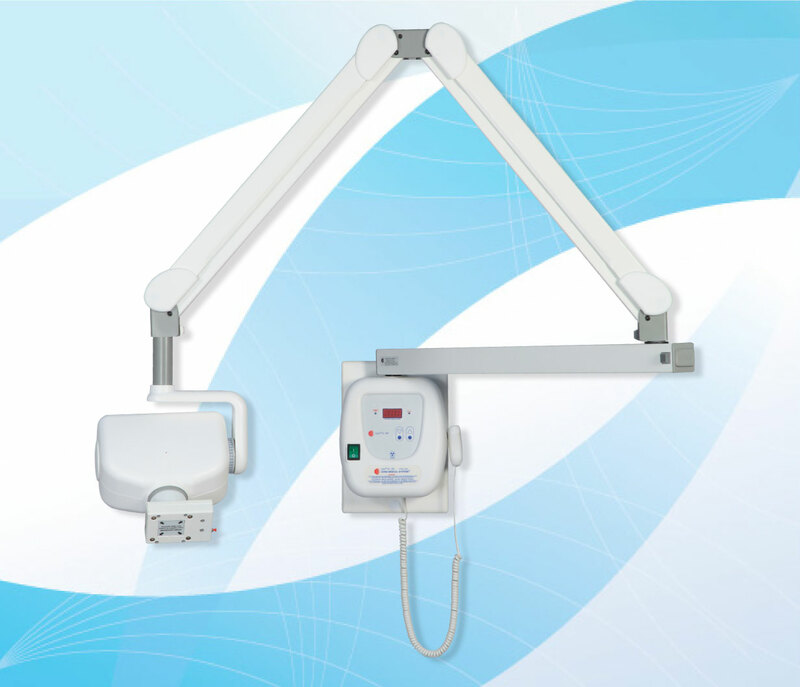 The long reach positioning arm allows the capture of the radiographic image without restrictions and from any angle. A 3 digit Timer with the widest range of exposure times allows the optimization of the tecnical factors, according to the type, size and weight of the species, with the traditional high speed film & reinforced screen cassette, or the new digital image receptors. RATED ANODIC CURRENT: 8mA. +/- 15% . EXPOSURE TIME RANGE: 0,03 a 3,00 s., resolution of 0,01 s., pre-heating time for loading the x-ray tube is not shown on the display. MAXIMUM DUTY CYCLE: 1:30 (1s. on, 30 s. off), automatically controlled by the microprocessor. NOMINAL: FOCUS IMAGE RECEPTOR DISTANCE: 67 cm. (26") for a 8" x 10" cassette. 79cm. (31") for a 10" x 12"cassette. 115 cm. (45") for a 14" x 17" cassette. BEAM CENTERING DEVICE/COLLIMATOR: 4 laser diodes, self powered by 2AA alkaline batteries. TOTAL FILTRATION: Min. 2 mm. Al eq. LEAKEAGE RADIATION: Less than 50 mR/h @1m. Technical factors: 70KVp, 8mA, 1s. NET WEIGHT: Mod WM: 27 kg. Mod MM: 46 kg. SHIPPING WEIGHT: Mod WM: 33 kg. Mod MM: 53 kg. SHIPPING DIMENSIONS: Mod WM: 1 box: 95 x 52 x 28 cm. Mod MM: 2 boxes: 83 x 35 x 42 cm. y: 113 x 34 x 27 cm.